Ed. Note- We continue our look at the 100 Greatest Songs of the Modern Era with the final installment of our five-part series. For Part One and Andy's methodology, click here. For Part Three, click here. For Part Four, click here. “Without warning, the drums and guitars hit in unison, opening the song and the album with a heavy hammering groove. It’s like an inverted reggae song -- downbeat chords instead of upstrokes -- though Simonon’s spare bass boom gives it a slight dub feel. From there, it’s all Armageddon prophesying and unwillingness to lay down and die,” said Billboard. Pitchfork described the song as “the record’s cosmic lynchpin: Horrifyingly apocalyptic, ‘London Calling’ is riddled with weird werewolf howls and big, prophetic hollers, Mick Jones’ punchy guitar bursts tapping little nails into our skulls, pushing hard for total lunacy. Empowered and unafraid, [Joe] Strummer reveals self-skewering prophecies, panting hard about nuclear errors and impending ice ages. Glenn Frey, the Eagles’ other primary singer, felt that the band “achieved complete ambiguity” with the song’s lyrics, which they modeled after Steely Dan’s style. The song’s closing guitar solo is often ranked among the best ever, which helped cement the song as a classic rock staple. The song became so symbolic of American culture that “when a US spy plane made an emergency landing in China in 2001, the crew members were asked to recite the lyrics to prove their nationality,” BBC recounted. “By 1958, Berry was rock & roll's most consistent hitmaker after Elvis Presley,” said Rolling Stone. “Unlike Presley, Berry wrote his own classics. ‘I just wish I could express my feelings the way Chuck Berry does,’ Presley once confessed.” ‘Johnny B. Goode’ was Chuck Berry at his most expressive, telling the autobiographical tale of his rags-to-riches rise to superstardom. Singing and strumming at breakneck speed, Berry produced the most memorable song of the 1950s. Songwriter Paul Williams said of ‘I Heard It Through the Grapevine,’ “It’s hypnotic. The tambourine rattle at the beginning puts us under, and the soft-spoken, relentless rhythm track holds us in trance. The sinuous vocal completes the package…There’s a beautiful, unyielding tension in this recording.” Marvin Gaye did not write the song, but he wrapped himself up in that tension. “I believed every word of the song. The doubting, the friends whispering in my ear, the suspicions,” he said. Blender, upon naming it the best song of the last 25 years in 2005, said it was, “One of the most sonically eccentric, psychologically fraught, downright bizarre things ever to land on Top 40 radio…frighteningly stark, with a pulsing, cat-on-the-prowl bass figure, whip-crack downbeat and eerie multi-tracked vocals ricocheting in the vast spaces between keyboards and strings…a five-minute-long nervous breakdown, set to a beat.” Since it was lengthy for a pop song, Producer Quincy Jones said, “Michael, we’ve got to cut that [29-second] intro.” But Jackson said that was the part that made him want to dance, and Jones gave in. “When Michael Jackson tells you, ‘That’s what makes me want to dance,’ well, the rest of us just have to shut up.” It has been one of the world’s most beloved dance songs ever since. Author John Covach called it “one of the most important single tracks in the history of rock music; clocking in at only four minutes and forty-five seconds, it must surely be among the shortest epic pieces in rock.” For the song’s climax, The Beatles brought in 40 musicians with various instruments and instructed them to play from the lowest note to the highest. Two weeks later, they gathered numerous pianos and turned the levels up so high Ringo’s shoe could be heard squeaking. Each band member hammered out an E-major chord, which resonated for 40 seconds, closing one of rock’s most influential albums with one of its most memorable moments. Author Ben Edmonds called ‘What’s Going On’ the “most avant-garde hit Motown ever had” in his book about the album of the same name. Motown founder Berry Gordy vehemently opposed the song, which was much more politically charged and musically eccentric than conventional Motown records. But Gaye had grown tired of conforming to Gordy’s style, and he refused to record anything else until ‘What’s Going On’ was finally released as a single. Bruce Springsteen put everything he had into this record as his desperate, final chance to break through and achieve his dreams. His genuine energy pervades the song, one of the richest, most powerful and enduring rock anthems in history. He added over a dozen guitar tracks, numerous keyboards, glockenspiel and strings to succeed in emulating Phil Spector’s renowned “wall of sound.” Critic Robert Christgau said it was “the fulfillment of everything ‘Be My Baby’ was about and lots more.” Springsteen said of ‘Born to Run,’ “I had enormous ambitions for it. I wanted to make the greatest rock record I'd ever heard.” As lofty as his goals were, he just about accomplished them, transforming a fledgling career into one of the most legendary in American music history. Richie Unterberger explained part of the reason behind its effectiveness: “What could have very easily been boring is instead hypnotic because McCartney varies the vocal with some of the greatest nonsense scatting ever heard in rock.” Musicologist Alan Pollack said the song was "such a good illustration of two compositional lessons – how to fill a large canvas with simple means, and how to use diverse elements such as harmony, bassline, and orchestration to articulate form and contrast.” He added that the coda provides “an astonishingly transcendental effect.” After hearing McCartney perform it in London in front of 80,000 frenzied fans, I agree. The Beach Boys utilized an eclectic array of instruments, including a jaw harp, electro-theremin, cello, string bass and bowed tremolo, to create what band publicist Derek Taylor titled a “pocket symphony.” Author Domenic Priore remarked, “This was a period when pop records were either guitar, bass and drum combos or traditional orchestrated arrangements for vocalists…The exotic instruments, the complex vocal arrangements, and the many dynamic crescendos and decrescendos all combine to set this record apart from most pop music. In short, if there's an instruction manual for writing and arranging pop songs, this one breaks every rule." Bob Dylan’s lengthy, brooding, and resentful masterpiece defied every rule of pop music. “The most stunning thing about ‘Like a Rolling Stone’ is how unprecedented it was: the impressionist voltage of Dylan's language, the intensely personal accusation in his voice ("Ho-o-o-ow does it fe-e-e-el? "), the apocalyptic charge of [Al] Kooper's garage-gospel organ and Mike Bloomfield's stiletto-sharp spirals of Telecaster guitar, the defiant six-minute length of the June 16th master take. No other pop song has so thoroughly challenged and transformed the commercial laws and artistic conventions of its time, for all time,” Rolling Stone said upon ranking the song as the greatest of all time. But beneath its hopeful, heartening messages, ‘Imagine’ is “the most subversive pop song recorded to achieve classic status," according to authors Ben Urish and Ken Bielen. Lennon depicts an idyllic world, but also one that calls for impossibly drastic societal overhauls. However, people like to dream, and Lennon’s uplifting words have helped millions to cope with the harsh realities of this world and envision a brighter future. Rolling Stone also praised the song’s musical qualities, with special attention to “the serene melody; the pillowy chord progression; that beckoning four-note [piano] figure.” These facets combine to form a beautiful and wonderfully moving song, which ranks atop more all-time lists (7) than any other. “A shock wave of big-amp purity, ‘Teen Spirit’ wiped the lingering jive of the Eighties off the pop map overnight,” said Rolling Stone. In an instant, the tacky hair bands and synths that characterized ‘80s music seemed irrelevant. They would be swiftly overshadowed in the mainstream by grunge and alternative rock. 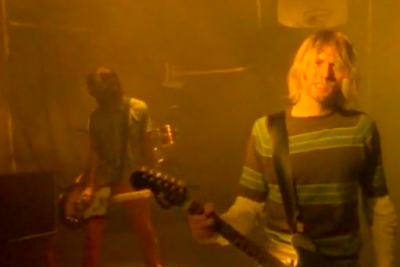 “The song was a call to consciousness,” said Nirvana bassist Krist Novoselic. Spin Magazine called ‘Teen Spirit’ the “most iconic song of all time,” and Goldsmith’s College conducted a study that validated Spin’s statement with its findings. While ‘Imagine’ tops more lists, no song features more often than ‘Smells Like Teen Spirit.’ Overwhelmingly regarded as the anthem of the ‘90s and Generation X, it appears on 84% of eligible lists, places in the top ten on nearly half, and makes the top five 30% of the time. For a field as subjective as music, that is a striking consensus. No song before or since has symbolized a generation the way ‘Smells Like Teen Spirit’ did for Generation X. It took all week, but we've finally reached the end. Thanks for reading, and here is the list in its entirety below.